DefiningElegance.com has just introduced Aviva Stanoff glassware to their product line. Beautiful vases and votive holders that celebrate rich colors, textures, and dimension. Each is hand-made through a three day process which includes silk-screening, metallic leafing, and hand-painting. Be inspired with the decorating possiblities and glamour of the Ginko, Collette, and Love Letter collections or give them as gifts for any occasion. They’re like no other. Clients may visit the Aviva Stanoff glassware collections for details. Sizes shown are available for immediate shipment. New from Signoria is the beautiful Uffizi Embroidered collection of 400 thread count 100% Egyptian combed cotton percale with embroidery applied to duvet covers, flat sheets, pillowcases, and shams.Signoria used the same design to create the Uffizi Jacquard collection which consists of a 650 thread count 100% Egyptian combed cotton jacquard duvet cover and sham. 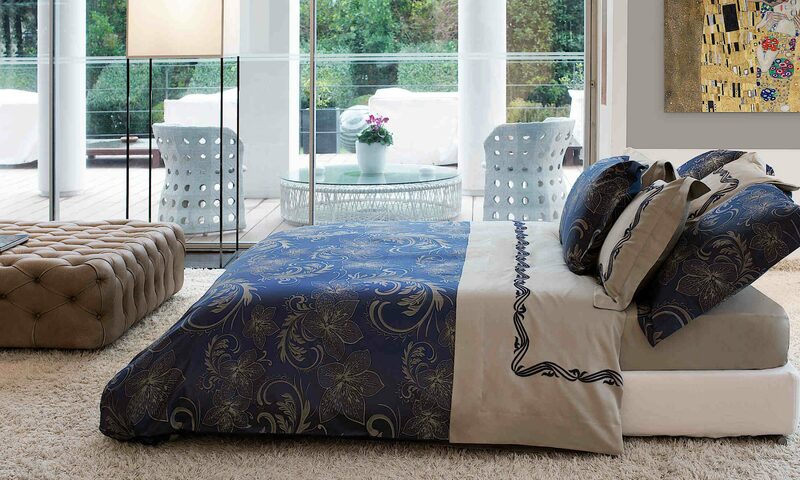 The duvet cover reverses to a solid sateen. Both collections come in two colorways, a luscious chocolate brown and a soothing wilton blue. Both can be mixed with Signoria Masaccio and Raffaello for a more personalized look. Clients are invited to visit Signoria to see the all the collections and for more details.